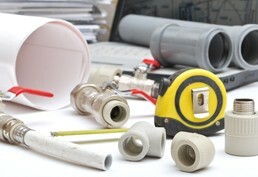 Need a plumber in Orford or Winwick? Ever find yourself searching for the right plumbers for a certain task? You trawl 'Yellow Pages' and a few local websites, you ask friends if they know anyone who 'does bathrooms' or 'fixes boilers,' only to waste more time before finding someone who you maybe can't be sure is competent enough anyway. Help is at hand. We're highly experienced and established full-service plumbers providing residents in Orford and Winwick with a full range of plumbing services. We've built a fine reputation from many satisfied customers who know who to call whenever they need a plumber. With a full range of services offered and a strong reputation to point to, you may just have found the versatile, reliable and competent professionals to put in your address book. The services we provide cover everything from a simple sink unblocking up to and including the instalation of a new boiler and central heating system. Perhaps you're tempted to fit a new bathroom? We could help you with that. We think you'll be pleasantly surprised at how cost-effective such a convenient and high quality one-stop plumber can be. See for yourself by asking for a free estimate. Get in touch today and let's see how we can help, and soon you'll be putting the phone number on this page in your address book knowing it's the only plumbers number you need. Call now on 01925 204955.